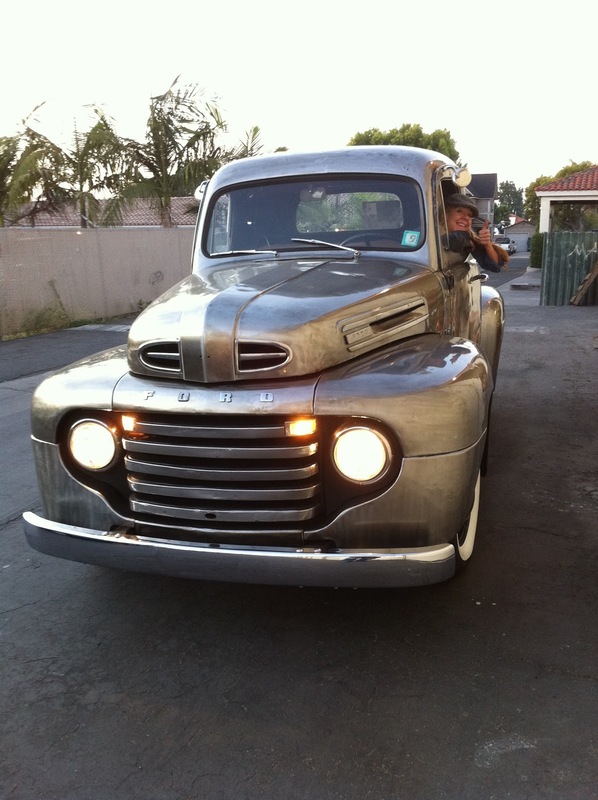 For nearly a month now, my sweet ’48 Ford F1, Bondorella, has kept all those poor motorcycles trapped in the Motor Palace—granted, not a badplace to be, but hey–they want to be free to ride and not be hassled bythe man! Up until a few weeks ago, I didn’t know a whole lot about brakes. I had a general understanding about shoes pressing into a drum, but didn’t know how it all worked. 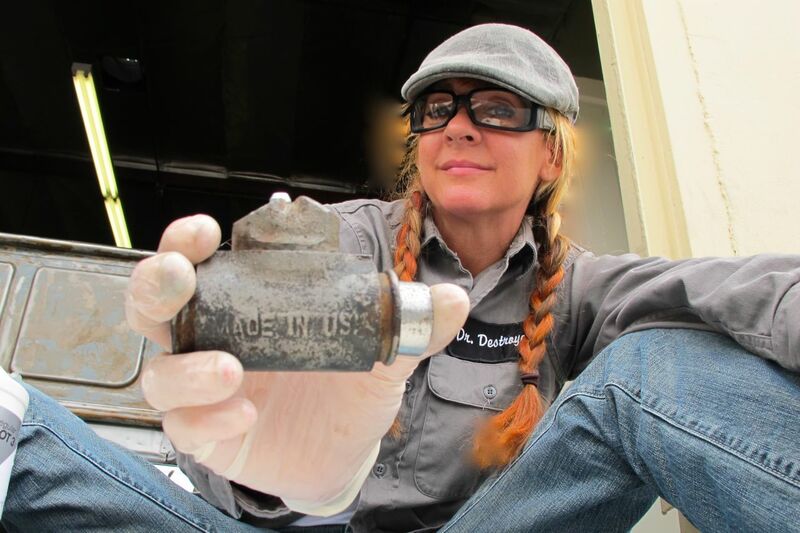 When Bondorella’s brakes failed on the I-5freeway in Southern California, I got a crash course in drum brakes (and luckily not a crash)! I’m no mechanic, but if you’re going to drive a classic, you should know at least some basics of how to work on it. I’ve been driving the truck since September 2010, and had never adjusted the drums; didn’t even realize I needed to! Takin’ apart the old drums. Now I understand how vital drum adjustment is to having good working brakes. I got in there, got greasy, changed the mastercylinder, some brake lines, added a remote reservoir, rebuilt the wheel cylinders, put in new springs and shoes… Whew! I’m exhausted just writing thelist! 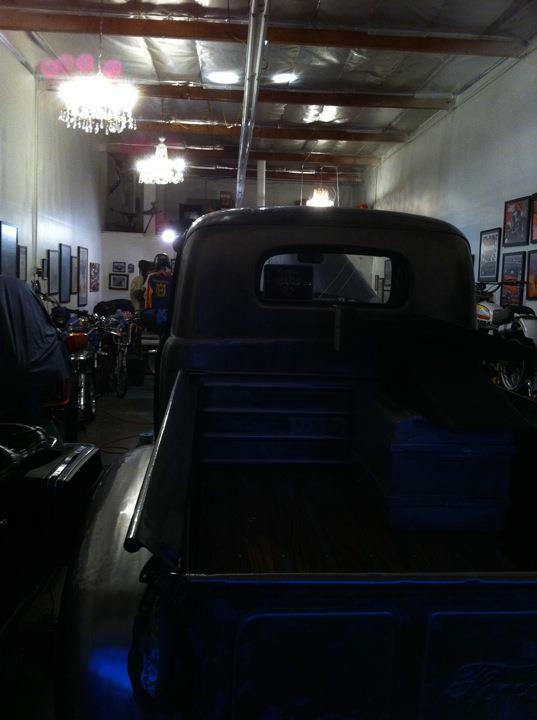 But really… it’s a pleasant experience wrenchin’ in the Motor Palace under the soft lights of the chandeliers! The short story? It took three weeks of work at night and weekends to get her going again, but I did it without having to be rescued on the job! I came very, very close to quitting toward the end and having someone take over, but ultimately, I wanted to do it myself. The long story? Click here to read all the details of the job. Guess what?? She stops now! And now let the motorcycles run free!!! Until next time when Brian falls asleep at the computer and I can sneak in with my two-cents….